Home » Dental news » Why wear braces? To close excess spaces between teeth. To correct teeth that are too procumbent. To correct a bad alignment between the upper and lower teeth. To correct a blocked out tooth into a normal alignment. To facilitate eruption of an impacted tooth. To correct a smile that you do not like. Because I do not like my teeth and I want better. Because I get teased on my teeth and I want to make it stop. Because I am shy to smile. Because I am missing some teeth and my dentist cannot put implants between crooked teeth. Because I have a hard time chewing my food with my teeth. “I have crooked teeth. When I was 10 years old, I wanted braces and the dentist told me that they would not get crooked anymore. I am now 20 years old and I want a beautiful smile.” quoting Isabelle. hello dr chamberland, your website is very informative. we are from chatham, ontario, canada. im looking into treatment for my son’s bite. our local orthodontist has mentioned braces but no further treatment. looking at the information on your site has convinced me that palate expansion is probably necessary. im thinking this orthodontist would be way too conservative with her treatment plan. i do not want my son to go through what I’ve endured with bite issues, facial asymmetry and jaw neck ear pain because some one is chosing for me. i am hoping that you might have names of on par colleagues that you can recommend that live in my surrounding area. chatham? windsor? london? sarnia? so i can get a second opinion. thank you for your time. I will answer with caution. 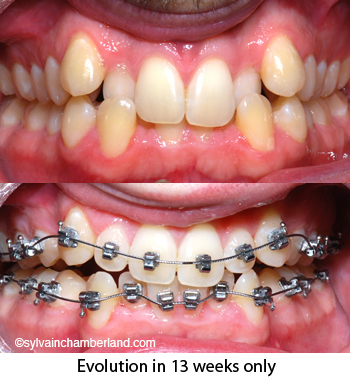 You may think that your son need rapid palatal expansion but if the orthodontist that you visit in Chathan did not mention he would do palatal expansion, it does not mean he was wrong and you are right. There are very good orthodontist in your area. I did a quick search on the web and some names are familiar even though I don’t know all of them personnally except for 1 orthodontist. In London, I would recommend Dre Paula Baby or her husband, Dr Jame Rojas. They are very good friend and they are both examiners of the Royal College of Orthodontists. This recommendation DO NOT mean that I am in disagrement with your local orthodontist.